Special interfaith delegation unites to condemn arson attack in Duma and commit to preventing future attacks. 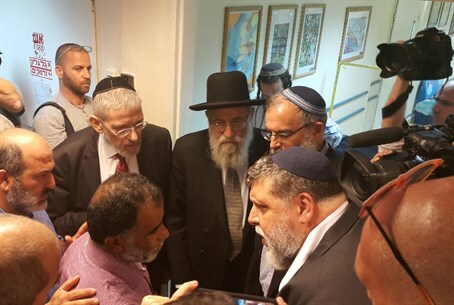 An interfaith delegation of rabbis and sheikhs met with the Palestinian Arab family injured in last week's arson attack in Duma on Monday, in a historic meeting organized by Tzohar, Rabbi Michael Melchior, and Sheikh Abdul Nimer Darwish. MK Abd al-Hakim Hajj Yahya (Joint List) also attended. "We gather here to console," Rabbi Rafi Feuerstein stated. "I hope and call for all of us that this meeting will only be the beginning of additional meetings for peace and brotherhood." Feuerstein also noted that he remembers the kindness of many in the Muslim community who came to visit the Jews in Har Nof after last year's massacre. "Whoever comes here in the name of religion, comes with the dictum 'do not kill," Rabbi Aryeh Stern added. "It's very unfortunate that we again meet against the backdrop of bloodshed." "Whoever murders does not deserve to be part of society," he continued. "Together we denounce it and are unwilling to say that this somehow represents our religion." "Whoever is created in the image of God must denounce this," Rabbi Michael Melchior stated. "The significance of this meeting is that both Rabbis and Sheikhs denounce terror." "We must act with ultimate responsibility to reach our younger generation and teach them that even when we might not agree with another’s opinion that never gives us the ability to physically attack or God forbid kill," he added. Sheikh Darwish blessed the rabbis for coming, and wished all of the rabbis "peace for you and your children."